Mark Twain in The Gilded Age: "The eight years in America from 1860-1868 uprooted institutions that were centuries old, changed the politics of a people, transformed the social life of half the country, and wrought so profoundly upon the entire national character that the influence cannot be measured." The North's victory in the Civil War preserved the Union and freed slaves, but the result was the the South was war-torn and poverty stricken. It took more than a century for the South to recover. 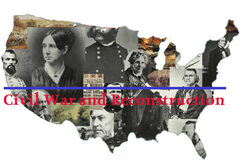 Although parts of the Nation suffered, the overall result of the war was a sense of disillusioned maturity. Lincoln's assassination and the exploitation of the South kept tensions high during the Reconstruction Era. 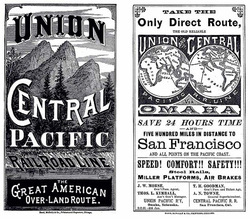 As the focus of the Reconstruction shifted to booming businesses and industry, the production of goods was being fueled by the expansion of the American Railroad system. In 1865 there was 35,000 miles of tracks, but by 1869 the miles of railroad tracks had increased to 200,000. These tracks linked the Atlantic to the Pacific Coasts and made the transport of goods easily possible. - Corruption, plunder, materialism, exploitation, financial piracy, political corruption, and labor strife were major issues. Men were getting wildly rich while others starved in the cities. - The industrial boom caused a flood of immigrants tempted by dreams of prosperity. The influx of immigrants and the co-mingling of cultures and classes during the war lead to Modern litterateur. Folk Ballads and tall tales developed. The frontier was glorified in literature. Writers criticized the problem of materialism and greed with social satires. This is the time of the final displacement of Native Americans. The Army forced the hunters off of the Plains onto Reservations in order to make room for the criss-crossing railroads and settlers. The buffalo were slaughtered to feed railroad workers. At the time, "savage Indians" or a romanticized account of Native American life were the only views of the native American people portrayed to white Americans. 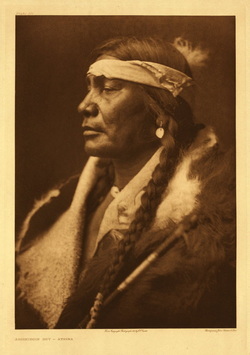 Bitter accounts of the wars are recorded in speeches given by Native American Leaders, such as Chief Joseph and Santana, who gained the respect of even their enemies. These three are the most renowned writers of this period. 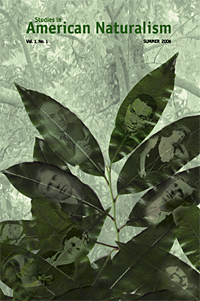 They wrote about the areas in which they lived and within their own realms of experience. Whitman, who pronounced himself to be the "poet of America," used bold images and symbols from average workplace objects in an effort to portray the truth of the American experience. Twain set his greatest works in Middle America, the place where he grew up along the Mississippi River. Dickinson discovered most of her inspiration within her Massachusetts home and the small household events she experienced. All three are marked by their astonishing use of language and form. Twain actually used humor in his novels, which had not been done before. Dickinson used slant rhyme in her poetry, the syntax of her lines is rather bizarre. Whitman developed free verse as a legitimate poetic form. The language that they used was the language of everyday life: farms, factories, housewives, and steam boatmen. Realism: The style of writing describes real-life experiences, with the hope that the truth of the experience will be clear through objective writing. 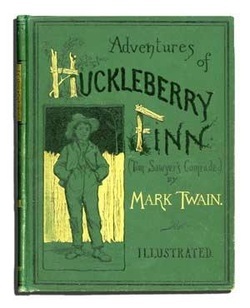 Beginning with Twain's writing in the 1860's, Realism dominated most American Fiction written up through the 1930's. Realism is partly a reaction to Romanticism, because many felt that Romantic fiction was too idealized, to neatly patterned, too grandly tragic and heroic to reflect real life. Realists were concerned with the immediate ethical consequences of everyday actions. To help readers "experience" real life, they attempted to re-create everyday reality, for they believed the truth of experience was to be found in events described accurately and objectively, undistorted by the writer's imagination. Naturalism is a theory in literature which emphasizes the role of environment upon human characters. It is an extreme form of realism which arose in the early 20th century. Rather than focusing on the internal qualities of their characters, authors called out the effects of heredity and environment, outside forces, on humanity.